« How Lucky Am I? 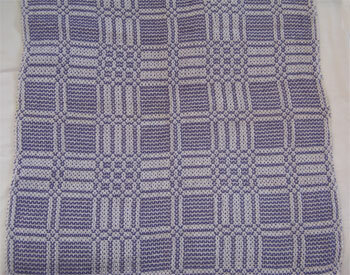 I wove 10 napkins. 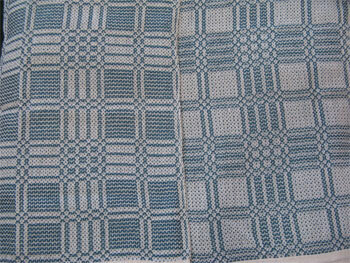 All have the same white warp, and all have the same summer & winter block design. Summer & winter means that’s what’s dark on one side is light on the other. 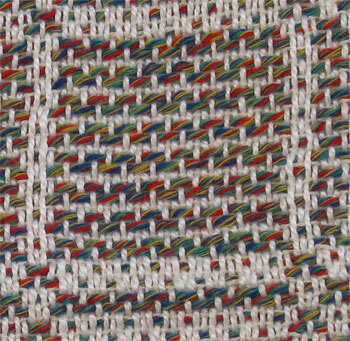 The term came from many years ago when coverlets were woven in such a way that people used the side that was mostly light showing during warmer weather, and mostly dark showing during colder weather. My goal was to have similar amounts of light and dark showing on both sides. 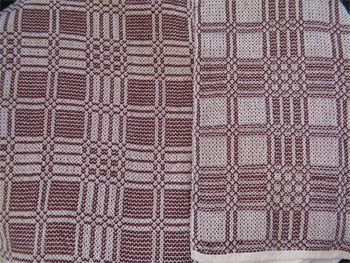 Here’s one napkin, woven with a burgundy weft, so you can see the whole design. It was important to me that for this project – a napkin that should be square – that my design repeat both horizontally and vertically. The planning was tedious, but I’m glad I did it. I think I achieved my goal of a somewhat architectural design fairly well for my first attempt, too. 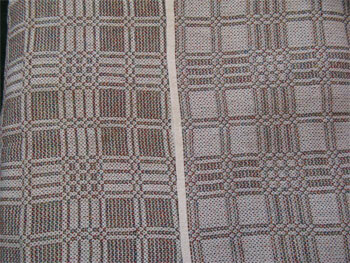 And here are the two burgundies, one up and one down so you can see the difference. 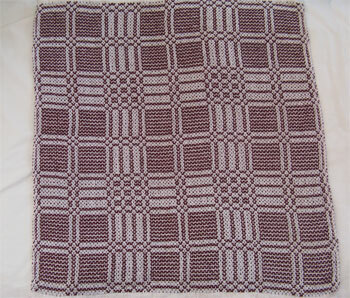 and 2 in an interesting multicolor variegated yarn. Here’s that variegation up close. 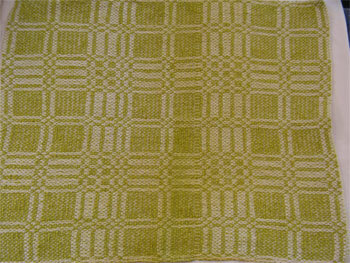 and 1 in an odd chartreuse boucle. Here’s the 10 of them together. You can see immediately that the chartreuse yarn was larger, and therefore resulted in a larger napkin. That’s ok. What’s far less than ideal is that the chartreuse color has been bleeding out like mad. I’ve now washed the napkin 3 times. After the first one, the entire thing was green; you couldn’t really see the contrast with the white. So I washed it again and the white showed better, but the green was quite blotchy, as you can see in the picture. I’ve now washed it a third time, and am waiting for it to dry to see how it turns out. That green one aside, I’m quite happy with my work. 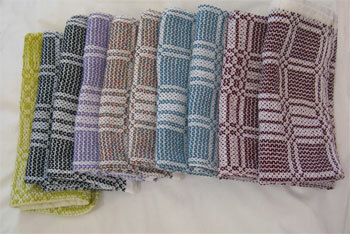 I’m pleased with the way it turned out, and happy that they will be traveling to 10 different weavers around the world. I’ve never done any block designs, and was pleasantly surprised to learn that I can turn out pretty complex patterns like this on my 4-harness counterbalance loom. 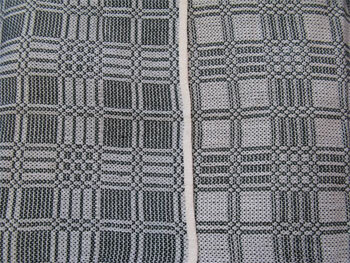 After weaving and wet finishing, I had to hand hem both sides of each napkin. They still all have to be pressed before I can send them off. Also, I’m still working on the reporting that has to accompany each napkin. That way, every person who gets one will have all the detail they need to know exactly how it was made, including both threading and treadling details, shrinkage rates, yarn samples, and more. Although I find this part tedious, I know when I get my ten napkins in return, I’ll be really glad for that much information. Your turn: have you expanded your repertoire recently? Wow – what a project – and what a neat concept for this exchange. I hope you get some equally wonderful ones in return and can learn a lot from them. Thanks, Judy. I’m really glad I signed up for this exchange, even though I don’t use cloth napkins. In hindsight, I should have signed up for a towel exchange. Maybe next year.